The 13th Annual Graduate Student Conference at the University of Rhode Island is a day of interdisciplinary scholarship. Graduate Students from all disciplines and a plethora of universities will come together to discuss some pressing contemporary challenges, questions, and solutions. This event will include a Keynote presentation by Dr. Solomon Friedberg, James P. McInytre Professor of Mathematics at Boston College and a Plenary Panel which will discuss the benefits and potential challenges of interdisciplinary work in higher education. This plenary panel consists of four distinguished faculty from URI: Dr. Kathleen Davis (English), Dr. Amelia Moore, Dr. Joan Peckham, and Dr. Phillip Clark. There will also be graduate student's sharing their research papers, posters; and new to the conference this year is the reading of creative work by fiction writers and poets. Please join us in Swan Hall on Saturday, April 13 . 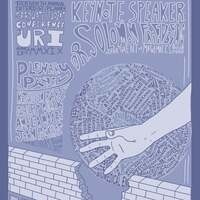 If you intend to come please email us at urigradconference@etal.uri.edu to register. Send us your name and the name of any guest that will accompany you so we can create your name-tag.